This unique textile is of cotton embroidery on an indigo-dyed handspun and handweave cotton ground. The upper register of the textiles depicts the great chariot of Bunga dyah (Karunamaya, Macchendranath) and the smaller one of Minnath, while the lower register depicts a great stone temple, likely that of Krishna in Patan. The textile is inscribed in embroidery with the date 1899, and was likely made as an offering to the Buddhist deities depictyed. 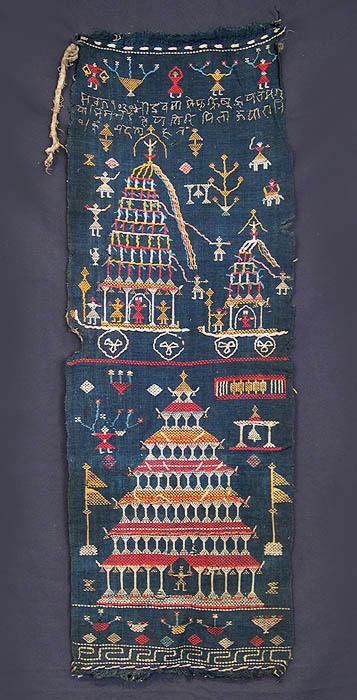 A companion textile shows other temple scenes, and the two taken together are unique examples of this technique in Newar culture.